My Son Holyland became a religious center under King Bhadravarman in the late 4th century and was occupied until the 13th – century- the longest period of development of many monuments in the world.Most of the Hindu Temples were dedicated to Champa Kings associated with divinities, particularly Shiva God who was regarded as the founder and protector of Champa”s dynasty .In My Son Holyland ,you can have enough time to see The Apsara Dance performed by Champa dancers(30 minutes). a) 23 $USD= 500.000VND for a group of 1-4 pax by private car A/C. 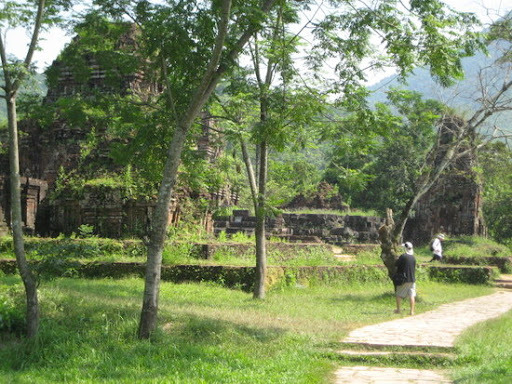 b) 27 $USD= 600.000VND for your group of 5-10 pax by private minibus A/C. My son holyland: 150.000VND for 1pax = 7 $USD for 1pax.